This article is about the Balcony in Gloomy Manor. For other Balconies, see Balcony. 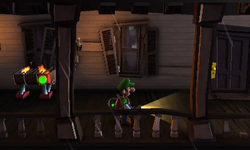 The Balcony is a room in the Gloomy Manor in Luigi's Mansion: Dark Moon. This room can be accessed by either taking the south door in the Dining Room or by taking the door hidden by Spirit Balls to the right of the Lobby. This room sits above the Patio and for a majority of the missions, is covered by large spider webs that block access to other parts. There are many Bats that hang upside-down from the ceiling. On the left side of the Balcony is a grill that can be activated using the Strobulb. In Sticky Situation, the Balcony is one of the rooms that is always covered in spider webs. This page was last edited on September 11, 2017, at 00:55.